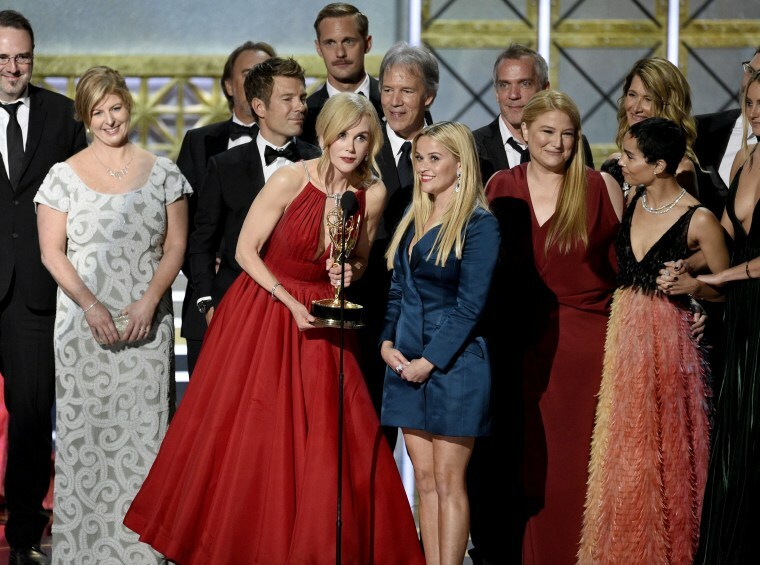 LOS ANGELES — The "fierce tribe" behind "Big Little Lies" has flexed some serious Emmy muscle as voters showered eight trophies on HBO's star-studded limited series. "Big Little Lies," shepherded by the production banners of stars Reese Witherspoon and Nicole Kidman, offered a remarkable display of female clout in a project that touched a nerve with viewers in dealing with domestic violence, divorce, child-rearing struggles and aging gracefully. Witherspoon, Kidman, Laura Dern, Shailene Woodley toplined the seven-episode series adapted from the Liane Moriarty novel of the same name. "The fact that we created four roles for women that all got nominated is a real win here," Witherspoon said backstage. "Big Little Lies" prevailed for limited series in a tight race with FX's equally starry "Feud: Bette and Joan." Kidman and Dern took the lead and supporting actress nods for a limited series. Alexander Skarsgard won for supporting actor in a limited series, while helmer Jean-Marc Vallee won for directing limited series. Backstage, Kidman, Witherspoon and Moriarty were pressed about the prospect of a second season of the show. Discussions are definitely afoot but the trio emphasized that it is not as simple as it sounds. Moriarty has the ultimate vote as to whether she feels theres more to say about the characters she crafted. "I'm thinking about it," she said. "It's a beautiful possibility." Kidman's voice was wavering as she accepted her first Emmy after three nominations. She cited the project's role in raising awareness of domestic violence that can happen to women of all social strata, such as her character, a wealthy lawyer-turned-stay-at-home mom in a deeply troubled relationship with her husband, played by Skarsgard. "It's a complicated insidious disease," Kidman said. "It exists far more than we allow ourselves to know. By you acknowledging me with this award, it shines a light on it even more." "This has been an incredible year for women in television," Witherspoon said, noting the opportunity in the current marketplace to allow female creatives to come forward "and make them the hero of their own stories."